We haven't been eating out much lately, due partly to the holiday money crunch and partly to the Logan working time crunch. When we do go out, there's a bit of a push and pull between going back to places we know and love (Bufalina, Barlata, Maudie's, Ramen Tatsu-ya) and trying somewhere new. Who wants to spend hard-earned dollars and hard-won free time eating a meal that isn't all that fun or delicious? We ended up at Salty Sow last week. Foursquare informs me that we'd been there once before, about a year ago. I remember a reasonably priced, heaving charcuterie board and lots of things in jars. 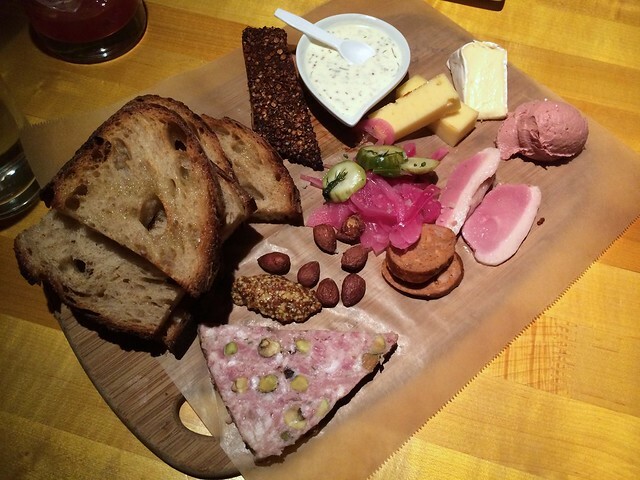 Charcuterie board to start. All of the meats were cured in house. The chicken liver mousse was ridiculously rich. Gah I love liver. We split an entree and a side. The serving sizes at Salty Sow are completely out of control. Logan and I had considered splitting an appetizer of french fries fried in duck fat, until we saw it delivered to the table next to us. It was easily a pound of fries. Entrees were no different. I swear we saw an entree delivered to another patron in a freaking SAUCEPAN, and the chicken thighs we chose came three to an order with six or seven fingerling potatoes. Three thighs! We ate one each and took the last one home, along with a couple of potatoes. Logan chopped it up and served it as a pasta sauce a couple of days later. Logan is the King of Leftovers. All bow to him. Oh, how'd it taste? Quite nice! 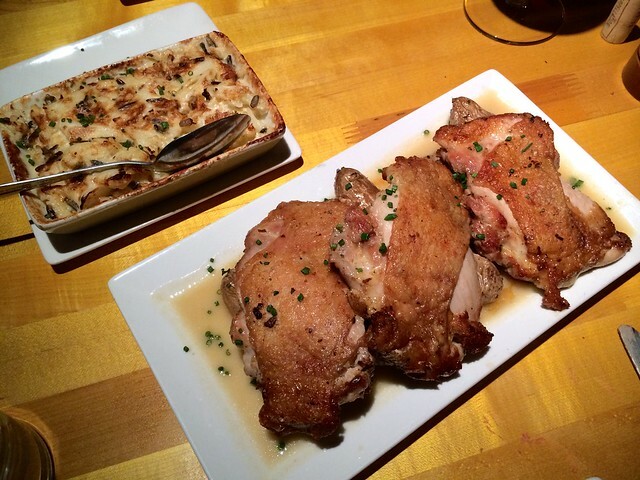 The chicken skin was crisp and seasoned well, and the meat was tender and moist. The gravy seemed like it had been built with a heavy glug of heavy cream, which we also noticed in the cauliflower and wild rice casserole. Salty Sow is not afraid of gigantic servings OR of butter and cream. Dessert. 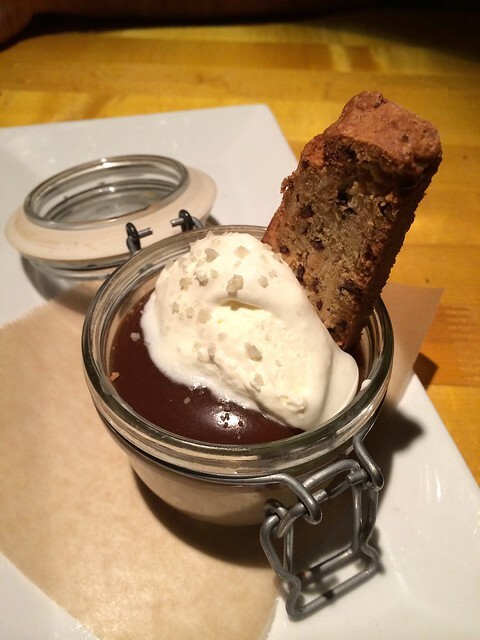 We almost never order it, but the butterscotch budino leapt from the menu and metaphorically grabbed me. I'm so glad we got it - this dessert made Logan SO happy! It was crazy creamy and a great mix of sweet and salt. Salted caramel is my nectar. All this, plus our two cocktails, plus a bottle of Les Vignes de Bila-Haut Côtes-du-Roussillon Villages from M. Chapoutier, plus tax and tip, set us back about $120. Not cheap. Still, it's a nice night out. If you go, dress up a bit, as the crowd (at least that night) was one of the better-dressed ones we've seen in this laid-back town. And definitely try that budino for us. Salty Sow. 1917 Manor Road, Austin TX (there's a new location in Phoenix, too.) Website. Reservations encouraged but not a must. Salty Sow has been on my list to try forever and I never make it over there. Thanks for the great preview and the reminder to move it up on my list. Looks delicious!! Really wanna have a try.